You haven't mentioned whether or not you want the numbers of the shops here. You would rather have me send you hay than talk to them directly? Anyways, spoke to my friend. She buys her hay from ebay.com, from a user called "farmer dave". This user sends packages to India regularly, from what she tells me. You'll need to open an account with them, and have a credit card handy. Be aware, though, that customs officials can sometimes wonder why you're having hay delivered, rather than use Indian hay, especially in a place like Punjab, where agriculture is so common! Let them know what the situation is, and you should be fine. Packaging and shipping charges constitute the main bulk of the price, but in the long run, it still comes out cheaper than if you were to buy the smaller bags here. She stays in Bangalore, also, but buys her hay online, as it is more economical. I'll be getting pellets in a week or so. Let me know what happens, ya? This question is apart from the current hay conversation, but I wasn't sure where to post it... so I'll go ahead and ask here. If there is a better thread to put it in, let me know, and I'll copy and paste it. Living in a tropical region, we have a large variety of vegetables that are common here and may not be in other countries. The opposite is also true: many veggies commonly fed there are not easily available here (i.e. lettuces). Some of these items may have alternate names, so please let me know if you would like me to find another name or describe the fruit/vegetable/leaf. I have a feeling that some of the listed fruits will have a very high fat content, but I would still like to check and see if they are alright to give. I don't know that any of those fruits and vegetables are toxic, but some seem too rich or oily. Anything starchy is probably a bad idea. My guys love bananas, but if they get it it's only a tiny amount. Coconut is all oil, so I'd say no. Probably the only things on that list that I'd consider... and only as a treat... would be guava and gooseberry. Maybe custard apple is okay in tiny amounts? The other's seem either too starchy, too sweet or too oily. And eggplant like tomato is a member of the black nightshade family. The leaves should never be eaten and the fruits should be ripe. Eggplant doesn't seem right for a guinea pig. I have heard that pigs don't like basil or mint and that it's a rodent repellant, but I think some people on here have said their pigs eat those. The only herb I feel good feeding my guys is cilantro (coriander). Maybe fennel is okay, but it's sweet and I'm guessing you would need to go easy on that. If anyone disagrees, please post. I am just spewing my opinions here off the top of my head and if it's not accurate I'd like to know! Good luck with your India pigs Pimpinpuji! I always love to know what it's like for pigs and their owners in places besides California! Let's see, with the possible exception of the gooseberry, I wouldn't feed any of #4. Between seeds and excessive sugar/starch I can't think they'd be good for a piggy. If they like any of the gourds, they are probably ok in small amounts and mine loves orange mint. She does not like a heavy licorice flavor and many mints have that flavor. I personally don't like okra so I've never feed it to mine. Too bad about the lettuces. Is it too hot where you are for them? Zoe and Bug's mom, thank you so much for the replies!!! I'm actually from Orange County, California, but I'm studying here. I bought them here, and will bring them back home with me when I'm done. I REALLY look forward to raising them at home, where pig-friendly products and accessories are much more accessible. I think the climates here are just not very lettuce-friendly. There is an organic produce company about a half hour from here that grows their lettuce, but their non-iceberg lettuce comes in bags as a mix. Unfortunately, the bags only last a maximum of 24 hrs, and so I can't buy in bulk. Thankfully, they enjoy cilantro. Pinky and The Brain have become so unbelievably finicky lately, that I don't know what to do with them! If I give them only one or two veggies and cilantro at a time, they won't eat. They need to have the tomatoes, the cilantro, the capsicum, the beans, the pomegranate, the sweet lime, the cucumbers, etc all at once - or its just not up to standard. They may not eat it all, but it has to be there, nonetheless. Unfortunately, even that has become boring for them, and I'm not sure how to make them eat, considering they are on the small side, as it is. I will definitely try out some gourd and goosberry!!! Thank you so much for your help! I'll post an update on here, as soon as these experiments have some results. Interesting. You were able to fly them there without issue? When are you moving back? Can you try growing some things indoors in pots? Cilantro is a good staple. I believe she purchased them in India but plans to bring them to the States. I don't know how that will work out though. Ok, I thought you wrote you brought them there. Some countries make you put them in quarantine for several months when you get there. Don't know if US is one of them. A few Indian International airlines allow pets in them. Not in the cabin though. I believe pets are to be quarantined for about a month before taking them to the US. Sus, I bought them here, in India! 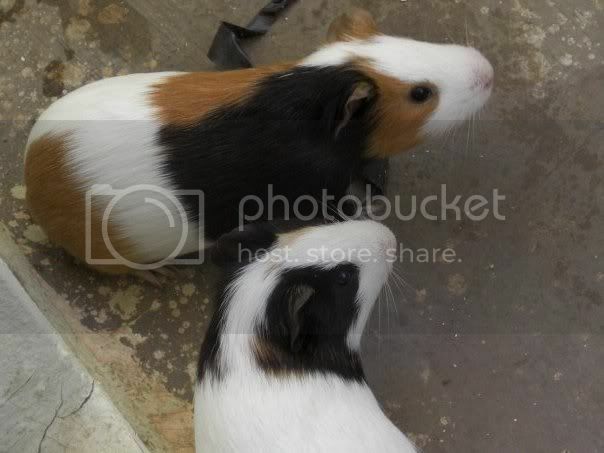 From what I have researched, there is no quarantine required on Guinea Pigs, as they do not carry any natural diseases. After landing, a vet has a look at them to make sure everything looks fine and healthy, and they can be on their way! I'll be leaving here in another 2 years, so lots of things can change between now and then. Hopefully, they will change for the better and not for worse! Kingfisher Airlines (an Indian company) has recently started travelling internationally, and they are quite pet-friendly. Hopefully, this attitude of theirs continues. Right now, though, they only fly into New York, which is another problem on its own, as I would have to find a way to get them across the US. I am really hesitant to send them in cargo, and would rather take them in the cabin. I suppose research will have to be done when the time comes. About the plants, I've never thought about that! I'll look into it! What plants are good for indoor growing? Any chance of posting pictures on this thread? I was also wondering about growing things yourself. I am imagining romaine with grow lights. Is your place air conditioned? It wouldn't hurt to try. 3. I end up getting more pictures of their bums, than I do of their faces. Sahil, I'm going for pellets on the 6th. What's your status? Do you need hay? Where are you getting pellets from, by the way? I have emailed pictures to people here who do know how to post them, and bless 'em, they've posted for me. I really should learn too. My friend has just moved to Mumbai. Have told her to do the needful. This is an experiment! If it doesn't work: well, then I guess I'll have to open up a photobucket account. If it does, goody goody gumdrops! 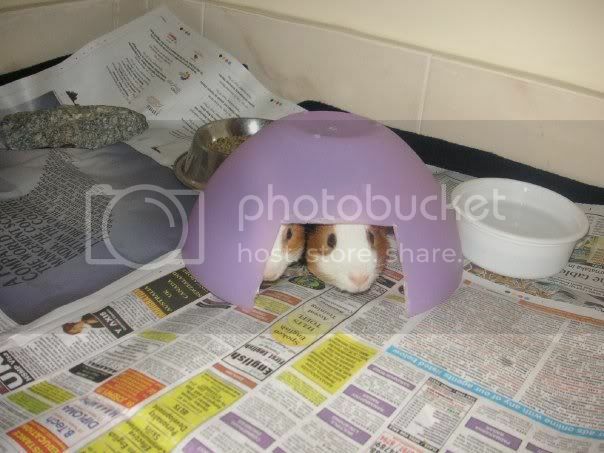 So, here is a fun picture from when the piggies were still really tiny, and when they were still using hidies (Now they have tents). ETA: Ok, that was a flop. I got it!! Ok here's a few older photos. The size difference between the two is quite evident. Now, the difference has reversed! Pinky on the right, and The Brain on the left. Over here, Pinky is on the left. In the beginning, I used one of those pet store cages layed on its side, and made two levels. 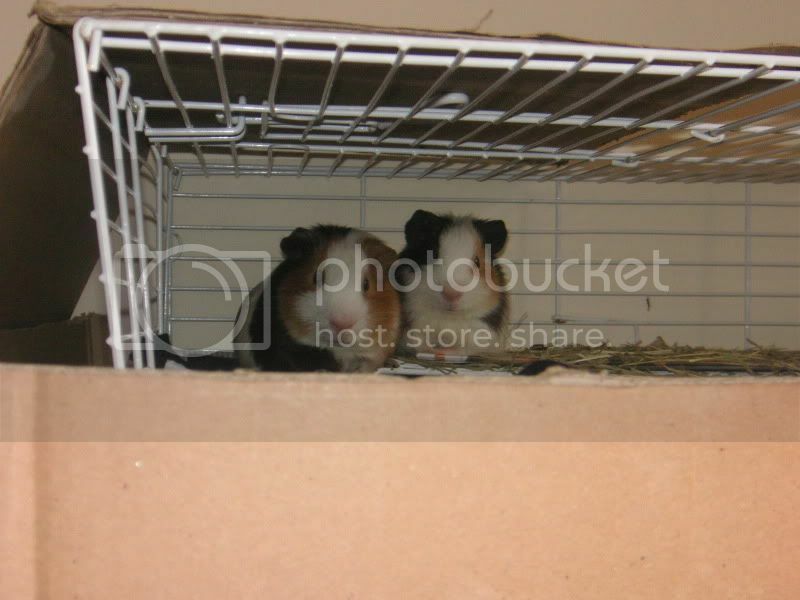 In place of a proper cage, I had used a cut up refrigerator box. This isn't a very good angle, but I like the expressions on their faces. 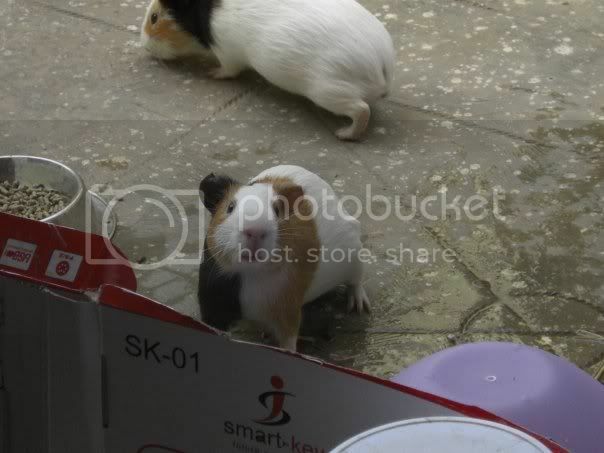 The boys going for a walk on the balcony, while their cage is being cleaned. 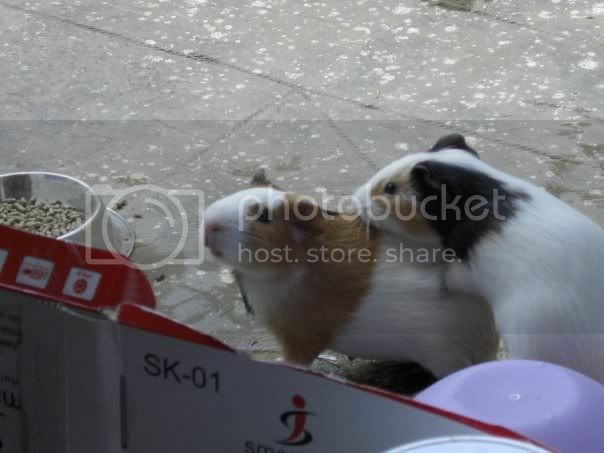 This series of pictures was taken at my boyfriend's place - he took care of them, while I had gone home for a few weeks. The Brain, harassing Pinky, as usual. The Brain knocked over the bowl of water, and then walked around in the puddle a bit. If you look closely, you can see little footprints in the background. Yay!! I finally posted pictures!!! I'll put some newer ones soon. I would like to add, that perhaps these pictures can also give an idea of how to make a cage big enough, if C&C is not available. When hideys are not available, cheap plastic bowls and cardboard are great to use! 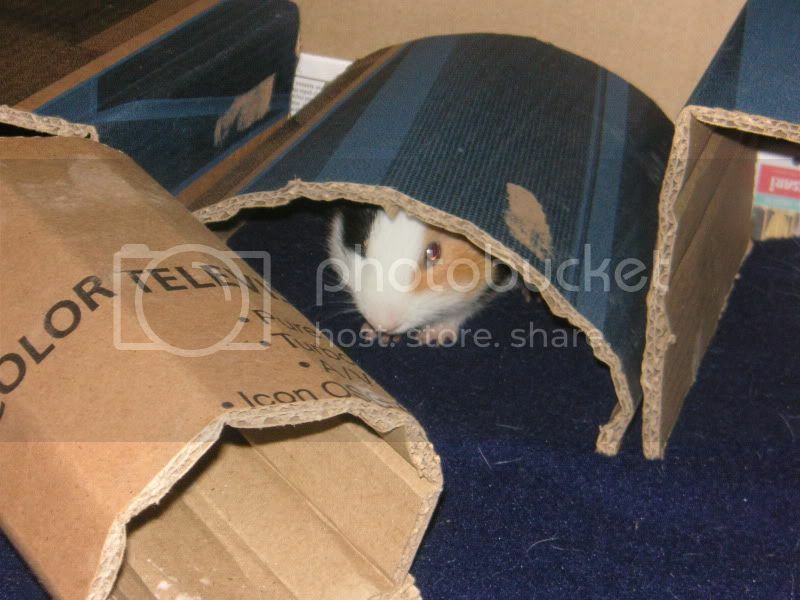 I'll get up a picture of my old cage with the cardboard as soon as I can find it.